Do you see? SNL is ruined for me now. Now when I watch SNL, I look at Brad at the end of skit and say, "Was that good?" and "Was that a good ending?" and "Is it just me or does Pete Davidson not belong on this show?" and other things that I shouldn't be thinking about when enjoying a nice lil live sketch comedy show. I can't remember the scenes but there were a few scenes in Parks and Rec where they kept referring to past episodes and Brad was all, "Wow, why do they keep referring to old episodes? The writers must have gotten notes to remind the audience about the storyline" and I was like wow, you just ruined this entire series for me, thank u.
I think Brad is v funny, I think everyone should go to one of his shows, he's the best. But now that I understand how jokes are formed, they aren't funny anymore. I'm not sure if I ever laughed at stand-up before, but now no one is funny. I only laugh at John Mulaney, Brad LaCour, Daniel Tosh, Billy Eichner, Miranda Sings, Wendy Williams, my own twitter and that's it. For example, I was at one of Brad's shows and this comic before him was telling a joke about pedophilia and idk if it's because im a genius or what, but I saw the punchline coming from literally a mile away. So I started laughing before the punchline and the comic got mad and i was like at least im laughing at something ur saying???????????????????? bc ur not funny????????????? 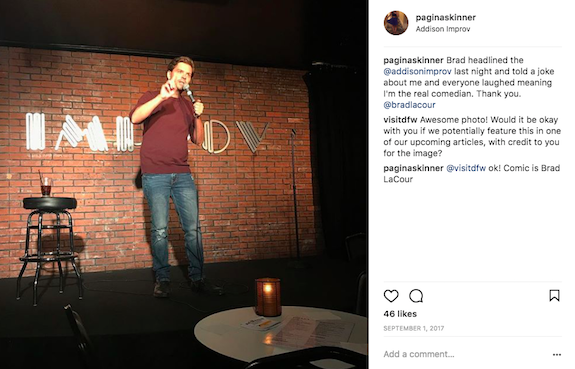 brad has ruined comedy for me. date a comedian. it's fun.